Michigan has been busy on the recruiting front over the past month, picking up three new commitments. The most recent--and the one that I'm actually writing about in a timely fashion--is defenseman Nicholas Boka, who just announced his commitment via Twitter. 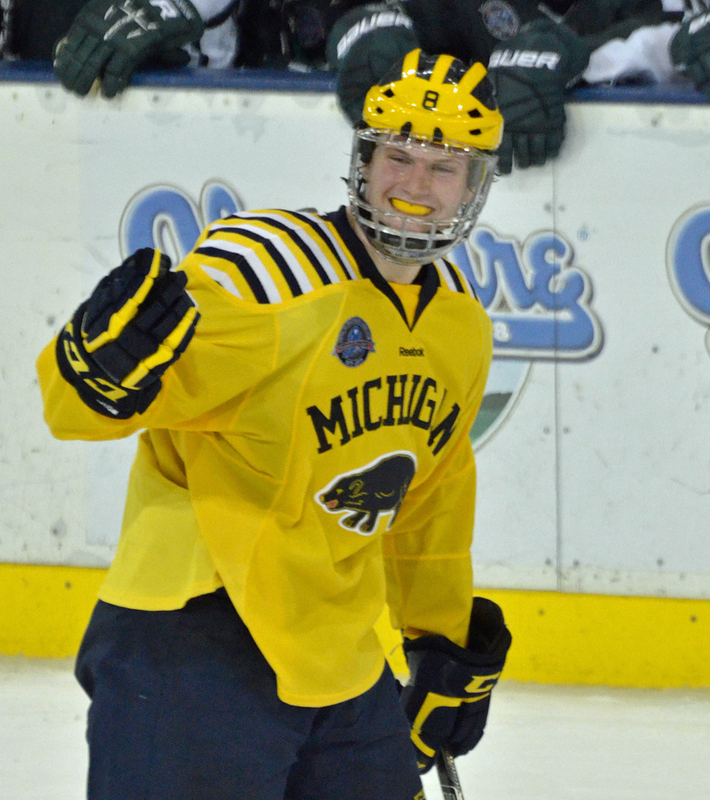 Boka was among the first seven players to commit to the NTDP U-17 team for the 2013-14 season. He joined fellow Michigan commitment Brendan Warren in that first group. That would make him a 2015 commitment. He's also a former Spartan commitment. Boka is listed at 6'0", 175. A good-sized kid who is probably still growing and he has a lot of upside to his game. He is not a flashy offensive-defenseman although he moves the puck well and isn’t afraid to skate it up either. He is quite mobile and plays aggressive. Boka showed some physical play at the back-end and plays sound position as well as controlling gaps. He looks to have pretty heavy shot from the point too. Nick Boka is yet another talented defenceman on a very solid back end for Compuware U16. Boka is dependable in his own zone, providing stable and well positioned support. Engaging in a physical brand of defence, Boka does very well for himself in puck battles along the boards and will throw his fair share of hits. Latent offensive potential should continue to develop has his skill set suits that branch of development. 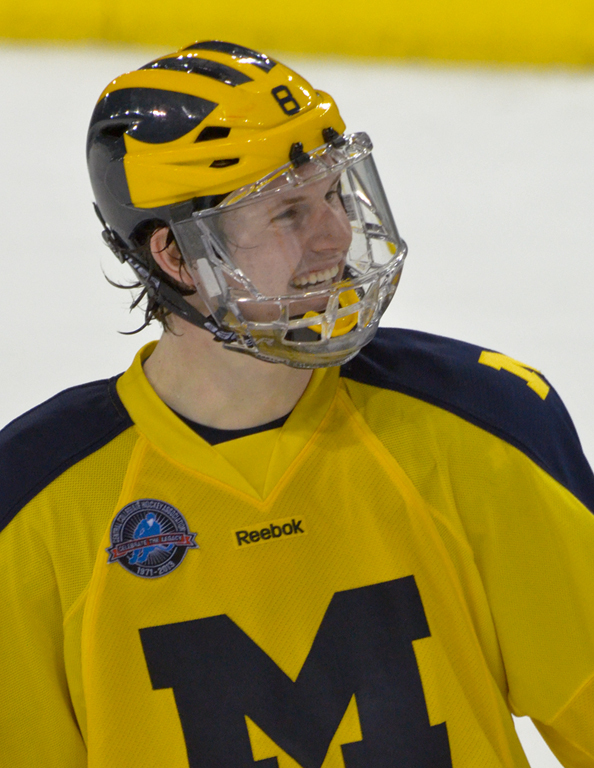 Boka has good mobility and reads the developing offensive situation allowing for successful transitions. In addition, an under-utilized shot from the point is another tool Boka possesses. Michigan State went with big and physical Nicholas Boka. We first saw Boka back in November as a forward and liked him at that position as he simply punished defenders on the forecheck. At the Select 15 Festival he played a simple and composed game and we pegged him at #30 in a deep group. Has good feet for a big guy and plays a pro-style game. Boka is a bit of a projection pick by the Spartans, but a good project to have. The Plymouth, Mich. native put up a 14-22-36 scoring line through 61 games played -- at both forward and defense. Michigan State recruit is developing into a big, two-way defender who plays with an edge. Has good feet for a big kid and seemed more confident with the puck on his stick this weekend than at the Select Festival over the summer. The Sarnia Sting hold his OHL rights. He was a 6th-round pick, but fell in the draft due to his commitment to the NTDP. OHL Scout Kevin Hess told MiHockeyNow that Boka is a "Good skating defender that plays on the edge. He is a punishing defender that finishes a high percentage of his checks. Great offensive instincts with a heavy shot from the point." 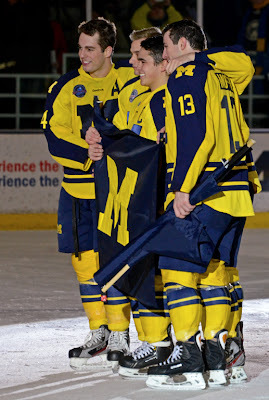 Also pledging to the Wolverines in the not-so-distant past are goaltender Hayden Lavigne (2014 or 2015) and defenseman Cutler Martin (2014). MichiganHockey.net has profiles of both Lavigne and Martin. Lavigne is a big goalie, listed at 6'3", 190 at the moment. He played for the Wellington Dukes of the OJHL last season and was 9-7-1 with a 2.48/.922. He was a third-round pick of Tri-City in the USHL Draft, but the Dukes are said to be expecting him to return next season. 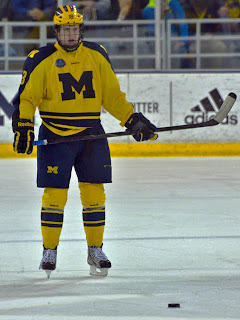 With the recent commitments of Lavigne and Zach Nagelvoort, and Steve Racine being just a sophomore, that would seem to close the door on Jared Rutledge returning to Michigan after a year in the USHL. It was confirmed that he will not return to the team next season. I wish him nothing but the best (as long as he stays out of the Big 10! ), and I'm sorry it didn't work out in Ann Arbor. Martin hails from East Lansing and currently plays for the Tri-City Storm in the USHL. He's listed as 6'1" 210 and put up a 4-12--16 line with a -2 rating and 74 PIMs in 59 games last year. He was far-and-away the leading defense scorer on Victory Honda in 2011-12, with a 12-22--34 line in 38 games. Only one defenseman in that talent-rich league had more points than him that season (and he had 38 in 40 games), so he seems like he might have some offensive pop in his game. Storm Head Coach Josh Hauge said the following of Martin: "He can move pucks and keep the game simple, but at the same time he’s got nastiness to him and can be really hard to play against in front of the net." Martin will again be with Tri-City next year. If Lavigne joins him, I just might have to hit up a couple of USHL games next season. Chicago and Dubuque aren't too far away. 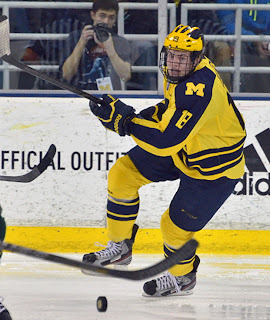 There was a fair amount of Michigan hockey news today, starting with the news that Jared Rutledge will not be with the Michigan hockey team next year, according to a report on The Wolverine ($ link). The Daily cited this report on their website as well, before amending their story to reflect that Rutledge told them, via text, that he will be returning next season. Spath said on the Yost Post message board that he can "100% guarantee" that Rutledge won't be back next year and told me on Twitter that his source is "impeccable". He also mentioned that Rutledge "could return in 2014-15". Since it's a $ link, I won't post any further details, though it's not hard to read between the lines about what's happening or where he might be playing. I have no reason whatsoever to doubt Spath, but it's a little odd that Rutledge is denying the report. I'm sure we'll find out more in the coming days, but I wouldn't expect to see him on the ice next year. Going elsewhere, playing a ton, and hopefully getting his confidence back is probably best for both parties, rather than him splitting time with two other goalies that have college experience and another recruit that was just brought in to compete for the job. Best of luck to Jared, whatever he decides. Spath's article also has some recruiting news, including a blurb about a player who was supposed to be in the 2013 class but is reclassifying to 2014. We'll talk about that once it works its way out from behind a pay wall. 2014 recruit Dexter Dancs dropped out of the rankings after being ranked in the midterm. Michigan's seven affiliated players on the list is tops amongst NCAA programs. Minnesota and Minnesota-Duluth each have six. PSU (2), Wisconsin (2), OSU (1), and FYS (0) combine for fewer ranked players than the other two B1G schools. In other news, the OHL is including language in their tryout agreements with players that might make them ineligible for NCAA hockey. No shocker, the OHL are a bunch of dicks. College Hockey, Inc. has reached out to the NCAA for clarification on the matter and should hopefully have an update in the near future. Billy Powers is being "prominently mentioned" for the vacant UConn coaching job. Bryan Hogan will play in Germany next year. Andrew Cogliano is up for the Masterton Trophy (HT: Center Ice) Cogliano and Hagelin are in the mix to be on the cover of NHL 14. Vote early, vote often. Also, where the hell is JMFJ in that contest? Lastly, I'm pretty sure I missed writing about this, but the club officially announced that Mac Bennett will be the captain next year with DeBlois and Copp alternates. That shouldn't surprise anyone as they're the three obvious choices. I love that Copp is wearing a letter as a sophomore. That means we've got three straight seasons (at least) where Michigan won't be turning over all their captains like they did this past season. Andrew Copp man. Andrew Copp. 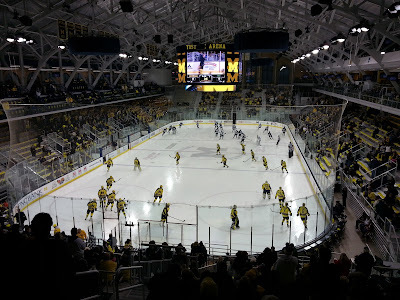 Even with the emergence of Steve Racine down the stretch, there was speculation that the Wolverines would look to bring in a goalie next season. They've done so, picking up a commitment from Zach Nagelvoort today. Nagelvoort played this season for Aberdeen in the NAHL (he started the season with the Soo before being traded at his request to gain some more playing time). On the season he is 17-6-2 with an impressive 2.10/.936. Since being acquired by Aberdeen, Nagelvoort is 8-1-1 with a 1.66/.949. He ranks 3rd in the league in both GAA and save percentage (though his save percentage is only 2 points out of the top spot). Despite some great play down the stretch from Nagelvoort, the Wings missed the playoffs. I've been told he'll be with the Green Bay Gamblers in the USHL for their playoffs, so maybe he'll see some postseason action yet! Last year he was 10-6-1 with a 2.27/.921 with Traverse City and Kalamazoo in the NAHL. This gives Michigan five goalies on the roster for next season, with Racine, Jared Rutledge, Luke Dwyer, and Adam Janecyk. I think it's pretty automatic that one of them won't be with the team next year. Racine you'd figure is a lock and I have a hard time believing that Janecyk would leave before his senior year when he's proven to be at least capable. Dwyer has never really played, and there was talk (though I don't know if it was more than speculation) that Rutledge could go back to the USHL for a year to get some confidence back. Time will tell. Even with Racine's play, there's definitely an opportunity to earn playing time. I'd imagine that Racine gets first crack at the job, but, like last year, the best player is going to play. Jacob Trouba will forego his final three seasons. The Wolverines have suffered their second defection of the offseason as Jacob Trouba has signed with the Winnipeg Jets. The freshman defenseman won Best Offensive Defenseman and was named first team All-CCHA. He was also a finalist for CCHA Rookie of the Year and won a gold medal with Team USA at the World Junior Championships. Only Alex Guptill and AJ Treais had more points than his 12-17--29 line, and only Guptill had more goals. He also blocked a team-high 53 shots and led the team in penalty minutes with 88. He also led the team with seven power play goals and 14 power play points. He was second on the team (!) with 115 shots. He quickly endeared himself to Michigan fans due to his hard hits and absolute rocket of a shot. 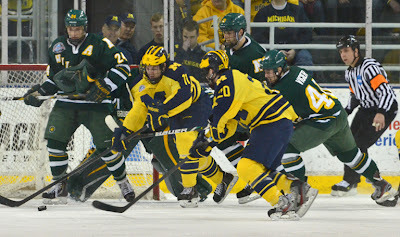 He was at his best in one of the playoff wins over Western Michigan when he had two highlight reel goals to lift Michigan to a victory. 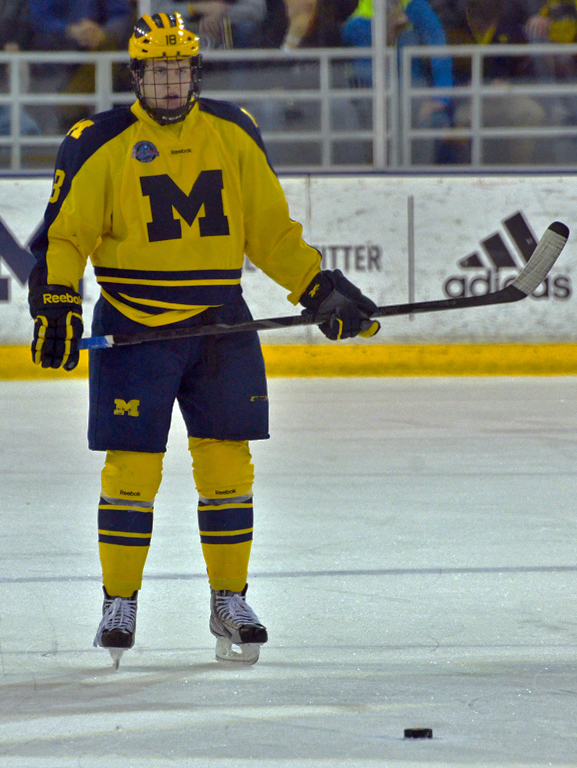 His departure means Michigan will be replacing three of their top four defensemen next year, with Jon Merrill also going pro and Lee Moffie graduating. Mac Bennett, Kevin Clare (who it now sounds like will be back next year), Mike Chiasson, Brennan Serville, and Mike Szuma will return on the blue line. The Wolverines will also add Michael Downing, Nolan De Jong, and Spencer Hyman. It was also mentioned as a possibility that Kevin Lohan could join the team next year. So Michigan will have bodies on the blueline, but there are some big skates to fill. Downing is the best candidate to be able to step onto the top pairing and play with Bennett. If Trouba skates with the big club before the end of the season--as I imagine he will--he will be the 19th Wolverine to play in the NHL this year. Wisconsin currently leads the NCAA with 19 players in the NHL (they have a 20th on a roster, but he has not played yet, so they could easily pull back ahead). In other news, it's time for the annual jersey auction. I imagine those #8 jerseys will fetch a pretty penny. 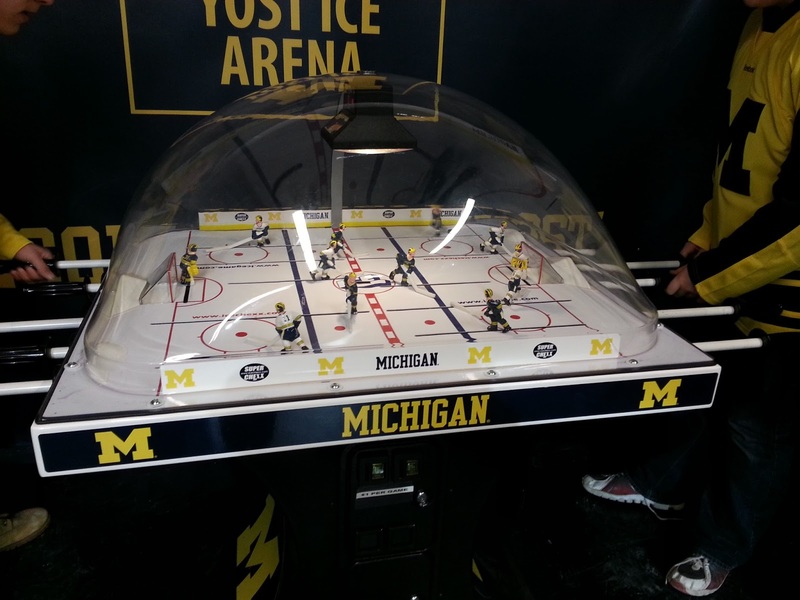 There are 5 options to pick from this year, with the GLI jerseys also up for bid. It looks like Moffie, Lynch, and Treais kept their blue jerseys, while Rohrkemper kept his white jersey and Sparks kept the GLI blue jersey. 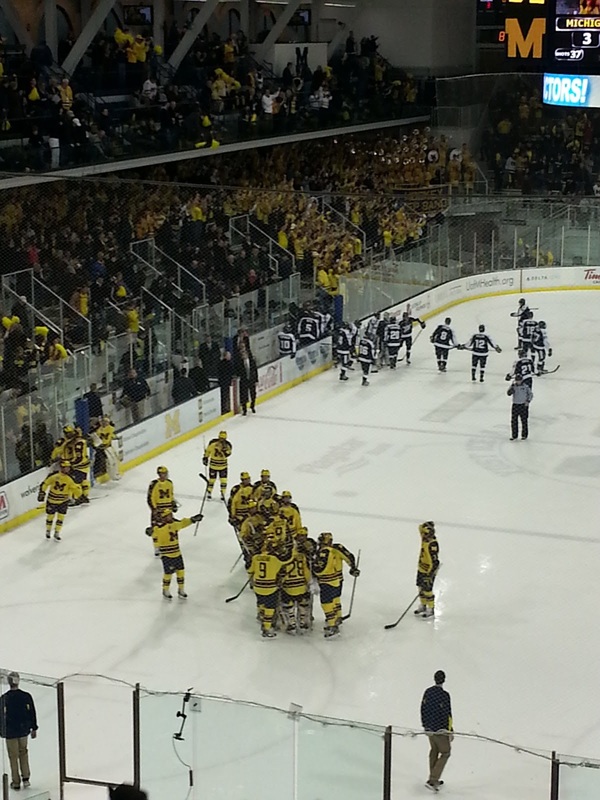 For the first time this year, the sweet sounds of "The Victors" have emanated from the Wolverine locker room. 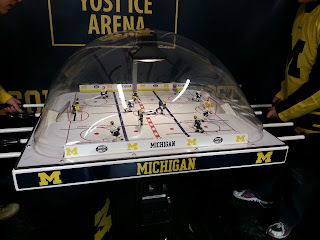 Michigan put together their first winning streak since the 2nd, 3rd, and 4th games of the season with a 3-2 win over the Spartans at Yost last night followed by a 5-2 win today at the Joe. 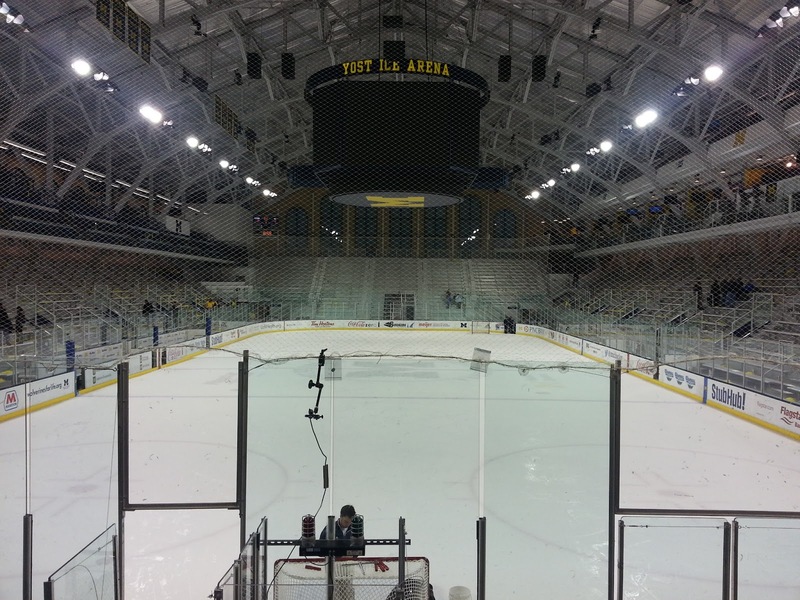 Boo Nieves, Derek DeBlois, and Phil DiGiuseppe were particularly awesome for Michigan this weekend. Nieves had a 3-2--5 line on the weekend, DeBlois scored three goals and was ridiculous on the PK, and PDG added five assists. Jared Rutledge was in net for both games and had a solid weekend. 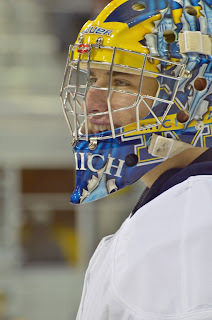 Two of the goals he allowed should have been stopped, but unlike previous games where a bad goal would snowball into 2, 3, or 4 in a period, he responded with some really nice stops and has clearly earned a spot between the pipes next weekend against Notre Dame. Michigan has only allowed fewer than 3 goals on 8 occasions this year, so it was nice to see it happen in back-to-back games for the first time all year. Also, it's worth pointing out that the Wolverines have only allowed more than three 15 times this year, but only once in the last five games. Progress. If you give up three or fewer you'll have a chance to at least be in the game. 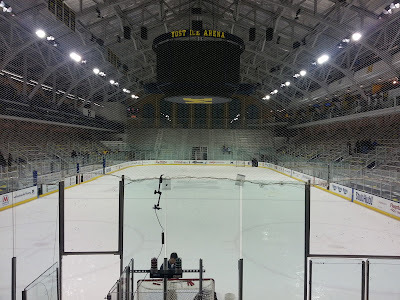 It was a late-arriving and fairly subdued crowd at Yost last night, and in the early-going the team matched the lack of enthusiasm of the fans. Rutledge made one nice stop in the early-going, but it took less than five minutes for the Spartans to get on the board last night at Yost. Serville had his pocket picked by Brent Darnell and Darnell lifted one up over Rutledge's glove from a sharp angle. Michigan started to turn the tide in the mid-to-late section of the period and ended up outshooting the Spartans 14-10 in the frame. DeBlois and Nieves were Michigan's two best players in the first period and it would later pay off for them. Nieves mentioned that in the locker room, the team decided that this was the time where they would usually fall apart and it wasn't going to happen. The team came out in the second period and played what had to have been one of their top 5 periods of the season. 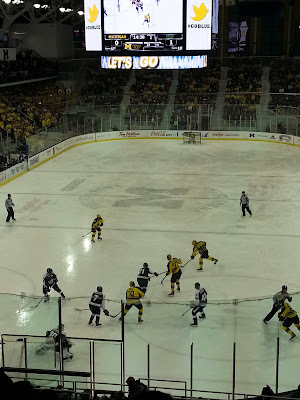 The Wolverines only scored one goal, thanks to some great goaltending by Jake Hildebrand, but they outshot the Spartans 14-4 and largely took control of the game. 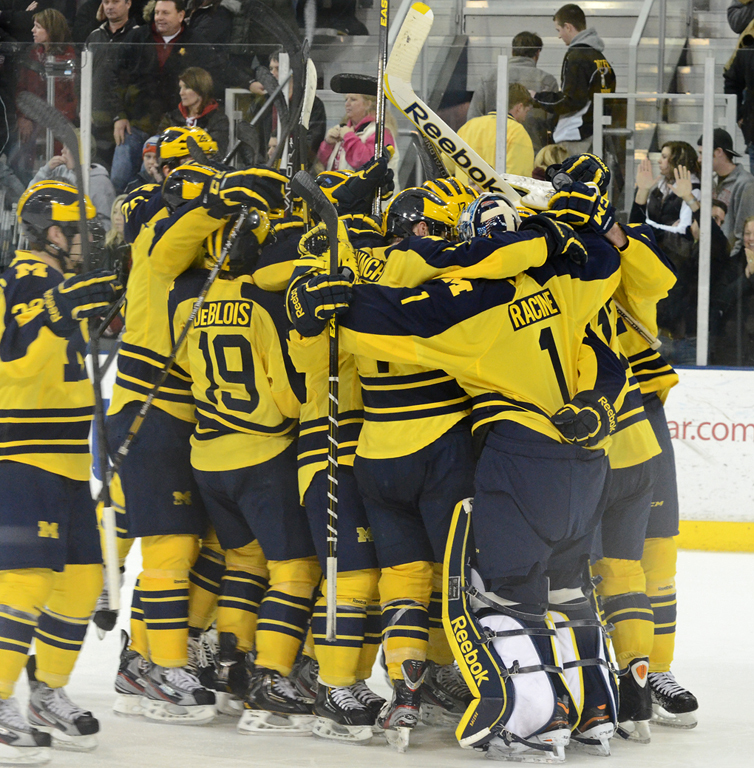 The Wolverines swarmed the Michigan State net for large parts of the period. 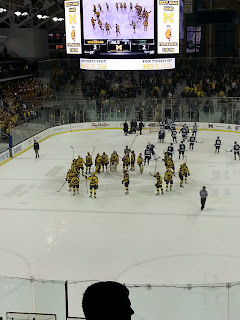 Trouba hit the post off a faceoff win, Moffatt nearly hooked up with Hyman just before Michigan's goal, and finally the Wolverines were able to capitalize. PDG kept the puck in the zone and got it over to Nieves in the middle of the ice. He slid a pass over to DeBlois who absolutely sniped one up into the top corner to even the game at one. Before intermission, Sinelli had a partial breakaway but a nice play by the Spartan defense forced a shot wide of the goal. ...the third period started with a bang as the teams combined for three goals in the first five minutes. A Spartan clearing attempt hit a teammate in the back and the puck stayed in the zone. PDG centered for Nieves who slapped it past Hildebrand. The Spartans answered less than a minute later, however. The Spartans won a battle in the corner and Kevin Walrod was able to get the puck to Jake Chelios just before he was hit by Mike Szuma. Chelios had a step on Rohrkemper and was able to pull the puck cross-crease and sneak it past Rutledge's pad to even the game again. It took Michigan just over two minutes to get back on top. A big hit by Kevin Lynch in the defense end freed up the puck for Nieves. He sent it up-ice to PDG and the DiGiuseppe hit him streaking into the slot. He one-touched it past Hildebrand for his second of the game, sixth of the year. That would be all she wrote. 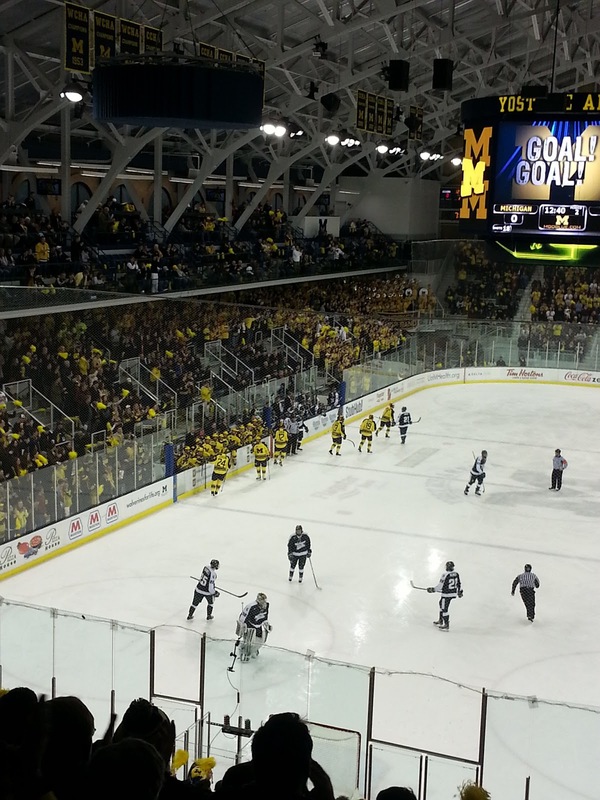 Michigan was able to kill of a Spartan power play in the last few minutes. The question then became how would Michigan respond? When they last defeated the Spartans at Yost, they followed it up by getting shelled the next night at Munn. They had three other chances to sweep a series but hadn't be able to finish the deal. The game got off to a poor start as Moffie was whistled for a penalty--his fourth of the weekend--in the first twenty second. 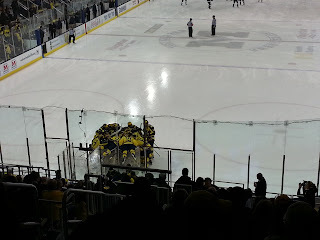 The PK again did their job, aided by two or three really nice saves by Rutledge, and the Wolverines were soon awarded a power-play of their own. 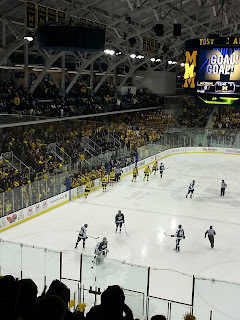 DiGiuseppe's shot was turned aside, but Luke Moffatt was able to get three pops at the puck in front of the net, eventually shoveling one past Hildebrand to give Michigan a 1-0 lead. Mid-period, the puck once again didn't lie. Andrew Sinelli was whistled for charging on what appeared to be a good, hard check. On the ensuing power play, Derek DeBlois stole the puck from a Spartan, skated in, and destroyed Hildebrand's water bottle with a shot for his second snipe of the weekend. Hildebrand had a couple of big stops late in the period to keep the game from getting out of hand early-on. He made another great stop on Kevin Lynch early in the second, off a great feed from Guptill. With Michigan on the power play, a Moffie turnover led to a rush the other way and Forfar beat Rutledge 5-hole to cut the lead in half. Merrill slashed Forfar as he was coming in, and the Spartans got a power play on the "and-one". After the PK did their job again, Andrew Sinelli was behind the net and found Andrew Copp in the slot. Copp tapped it through the wickets to put Michigan back up by 2. Nice to see two of the hardest working guys in the business rewarded for their efforts! The Spartans had the Wolverines on their heels for the last five-minutes or so in the period and they looked to grab some momentum as Wolfe dove for a loose puck and got it under Rutledge's pad. That one needed to be stopped. His pad got off the ice and the puck snuck underneath. 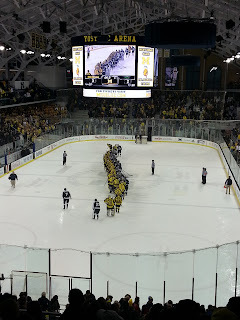 A lot of times this season, Michigan has failed to respond in situations like this, but tonight they did and it was Derek DeBlois again. Moffie flipped a shot toward the net and Hildebrand left a soft rebound. 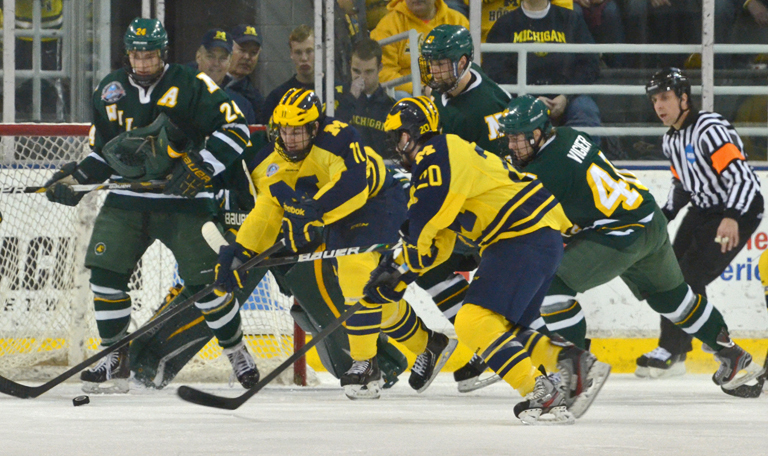 DeBlois was there to knock it home and the Wolverines went into intermission with their two-goal lead in tact. In the third, Nieves had a chance at the side of the net but hit it into the side of the goal. Rather than try to stuff it in again with Hildebrand out of position and a defenseman closing, he opted to take the puck around the net and throw it out front. 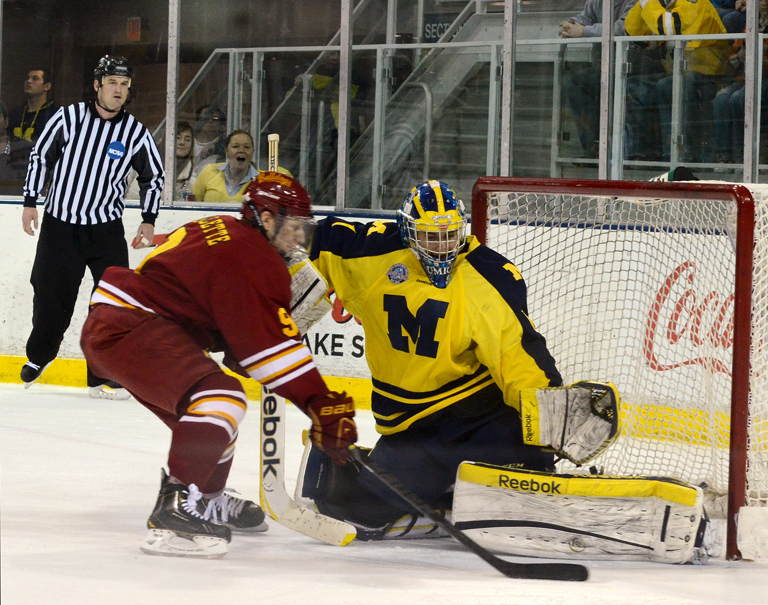 His centering attempt deflected off of Travis Walsh and bounced into the Spartan goal. The Spartans had a couple of looks after that, but nothing major. Michigan outshot FYS 45-28 in the game and got to celebrate their first sweep of the season with a 5-2 victory. Rutledge was named the third star of the game, which is really nice for him and has to do wonders for his confidence. The Wolverines now head to South Bend, and it will be really interesting to see if this little spark can ignite a fire. They're getting the Irish at a good time. After a great start to their year, the Irish would actually miss the tournament if it started today. They snapped a five-game losing streak with a win over Ferris State last weekend, but they've lost 6 of 7 and 7 of 9 heading into tonight's action. 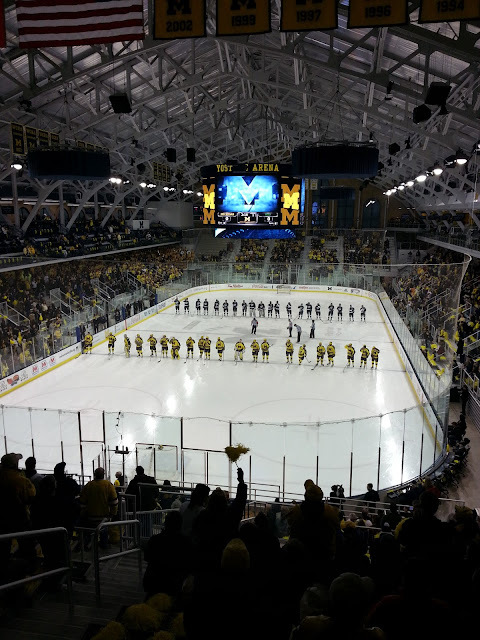 Michigan lost 3-1 and 4-1 games to Notre Dame at Yost earlier in the year, but they were competitive in both of those games before fading late. Talk of next week can wait. For tonight, the team just needs to enjoy their first sweep of the season and make sure it's not the last time this year that they get to sing "The Victors". In addition to the video above, I snapped a bunch of pictures this weekend with my Samsung Galaxy Note 2 and I'm pretty happy with how they came out. We were packed in pretty tight so it was nice to be able to just pull my phone out and get some quality shots when it was hard to dip into my pocket to get my camera out. The anthem. This is the new background on my phone.